FeedDemon is an RSS (and Atom) feed reader for the Windows platform. It has been around for a long time, and still is a popular news aggregator, if not the most. FeedDemon is lightweight and doesn't demand a lot of resources: the installer package is just a 3.6MB download, and a few simple clicks setup the application. Adding a feed is just as simple and the interface is quite intuitive too. While adding a feed, you don't need the actual feed URL of the site which you want to add -- the homepage URL will do just fine; FeedDemon will search for the feed URL of the site and grab it for you. You can also check a preview of the feed, before subscribing to it. This is done through the preview feature of the 'New Subscription' wizard. 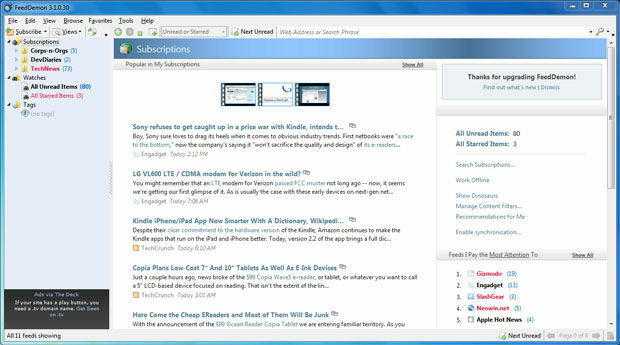 After a feed has been subscribed, you are given the choice to edit the properties of the feed: from basic customizations such as, editing the update interval, number of headlines to fetch... to advanced ones like content filter, podcast downloading, feed interface (newspaper style), feed validator and source viewer. The feeds can also be managed and similar feeds can be categorized in a folder. While this folder concept is good, the implementation very basic as it doesn't support cross-categorization (you can't put a feed in two folders). To handle this, the tag feature comes in handy, but it only operates on headlines, rather than on a feed. The interface is customizable, and neat (but you are given option to modify it as you may please, with the 'add/remove buttons' feature). In case you want to keep track of a recent/hot topic and want to add all the feeds related to it, the 'Find New Feed' will come in handy. When synchronized with the Google Reader, you can follow, share and pretty much replace Google's web interface with FeedDemon's. Among the many other features offered by FeedDemon, we found the tabbed browsing to be very useful. With tabs, you can read multiple news items and feeds right there, without the need of a web browser - even the shortcut keys work the same way. The web engine of FeedDemon is based on the Internet Explorer core -- while we love the idea of an integrated web browser engine, we wish it was something more capable than Internet Explorer. We would like to see an option where we could choose the browser we want it to use, to render the webpages. Note that the software is not freeware, but adware: the ad banner is only a strip at the bottom-left pane, it's hardly annoying, and easily overlooked. 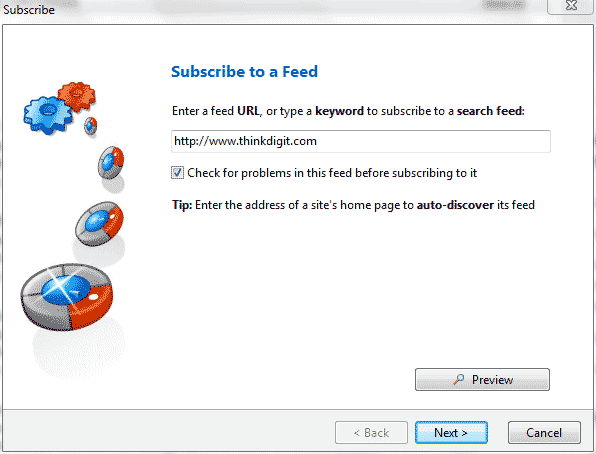 To download FeedDemon 3.1, click here. For all the latest 'Download of the Day' articles, visit here.